Dan Archer’s Graphic Journalism Uses Comics to Illuminate Survivors’ Stories in the Trenches of Human Trafficking : COMICS ARE EVERYWHERE! Dan Archer's self-portrait of the artist as social commentator on the cutting edge of today's contemporary Issues. Large portions of today’s audiences are sadly out of touch with topical issues impacting the world at large. And too often, viewers choose to simply look away and ignore the more disturbing aspects of the contemporary life. Ironically, social media can act as a cocoon insulating individuals inside a narcissistic balloon where things like poverty, social injustice and the specter of human trafficking feel a million miles away. Dan Archer is working against this global tide of willful forgetfulness by focusing on creating comics that give a voice to the dispossessed. The British-born graphic journalist wields comics as a means to bridging the gap of communication separating the affluent West from individuals in the Third World who are living with the fallout of human trafficking on a personal level. The end results are socially conscious comics plugging into the medium’s innate ability to maximize the power of words and pictures working in unison. 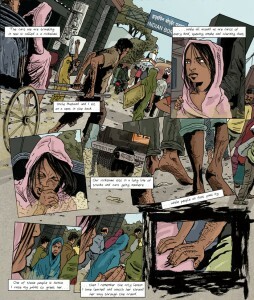 And Archer’s latest comics art is a wake-up call about the legacy of abuse that survivors of human trafficking live with on a daily basis and this intent beats at the poignant and lucid heart of his current work-in-progress Graphic Voices from Nepal: An investigation of Human Trafficking. Like his previous work, Archer’s comics explore the experiences of real people dealing with such often-ignored issues impacting many corners of the world. However, the comics creator is hardly an armchair social commentator calling for social change from the comforts of the West. An essential part of Archer’s creative process is immersing himself in real communities impacted by human trafficking to get first-hand accounts on the ground. After raising the necessary funds through a successful Kickstarter campaign, Archer traveled throughout Nepal to interview numerous survivors and to document their experiences in his sketchbook. Many of his comic-book pages were shown in a small art exhibition in Nepal’s Image Ark gallery. The powerful fusion of images and text from one of Dan Archer's non-fiction comics demonstrates how the artist allows his subjects to come to life on the page. Archer’s drawings offer simple and clear depictions of his subjects grounded in the minutiae of their everyday lives. We see straightforward images of village and urban life unfolding in the natural rhythms and pace of Nepal. The artist’s deliberately strips away anything that might impair the reader from being immersed in the story. The work is never about seducing the viewer with stylistic flourishes and fancy drawing techniques. Instead, simplicity is the key to luring us into the inner sanctum of these people’s difficult lives. Archer’s methodology can be traced to his earlier works in graphic journalism like The Honduran Coup: A Graphic History and Borderland: Seven Stories Told as Told by Victims of Human Trafficking. 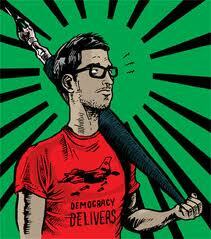 Archer is also the first comics journalist to be elected to the John S. Knight Fellowship in 2010 and 2011. And his comic-driven journalism appears in such diverse forums as The Huffington Post and the Guardian UK. More recently, Archer’s work was featured on the BBC’s Web site. However, Archer is hardly alone in seeing the potential for comics as a vehicle for non-fiction storytelling. The artist is part of a new wave of comic-book creators who are confronting the real world head on through their art. Other non-fiction graphic novels addressing provocative subjects include Joe Sacco’s Palestine and Art Spiegelman’s Pulitzer Prize-winning Holocaust memoir Maus, among others. Against the backdrop of his drawings, Archer uses his captions as a space for his subjects’ words to tell their own stories. He keeps his eyes and ears open as his pen darts across the pages of his sketchbooks, simultaneously recording what his subjects’ first-person testimonies while doing quick renderings of who and what’s in front of him. Like the best journalists, Archer’s multifaceted comics lend a human face to complex issues. The artist’s graphic journalism is fueled by these running monologues juxtaposed with his watercolor and India ink drawings rendered with pens and brushes. And the fusion of drawings and text compresses the vantage points of numerous people to form a clear, linear narrative that viewers – particularly Western audiences – can easily digest and understand. At the 2010 and 2011 Alternative Press Expos in San Francisco, I filmed interviews with Archer while he manned his table among the throng of alternative comics creators and readers flocking to Comic-Con International’s more indie-minded sister comic-book convention. I instantly realized that Archer’s use of comics to tell non-fiction narratives would fold nicely into the evolving story of Comics Are Everywhere. With a little luck, I will do a follow-up interview on Archer’s home-turf at Stanford University in the future once the artist-journalist returns to the United States in June. In addition to preaching the gospel of graphic journalism in remotes parts of the world through his artistic practice, the Eisner-nominated artist teaches the graphic-novel project at Stanford University’s Creative Writing department. Archer’s comics prove that the medium can stand head to head with prose and journalism to communicate real stories rooted in the hard realities of the human condition.